When it comes to your health care, does your doctor or team of doctors have your back? Do you trust that your health care providers will guide you in the right direction? Through this journey called health, are your doctors inspired to help you reach your health goals or do you feel they are just doing a job, going through the motions to get paid? Does your current health care team have these traits? You need two types of health care providers. One that helps in times of crisis and one that helps prevent a crisis from happening by optimizing the function of your mind and body. Through all the healing arts there are examples of these kinds of doctors. As a 100 Year Lifestyle chiropractor, we help people who are in crisis, we help people make healthier choices that are good for you and your family and we will help get your body functioning to its full potential. We have your back and more. Thanks for trusting us as an essential member of your health care team. If you have not yet come in for an evaluation, give our office the opportunity to serve your health care needs. 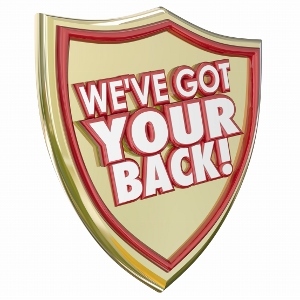 We've got your back!